As an online insurance comparison website, we handle thousands of quotes for van drivers across the UK. We appreciate that, for tradesmen in particular, having the right van insurance in place is crucial for ensuring that they can get on with the day job. Aside from offering the best possible service, we’re always interested to see how the different trades compare for driver safety – and we know that a little healthy competition amongst the tradesmen community isn’t necessarily a bad thing! If you’re a gardener, we’re afraid you came out top as the most accident prone van drivers. 77 per cent of gardeners had a collision claim last year; the highest percentage of all tradesmen. 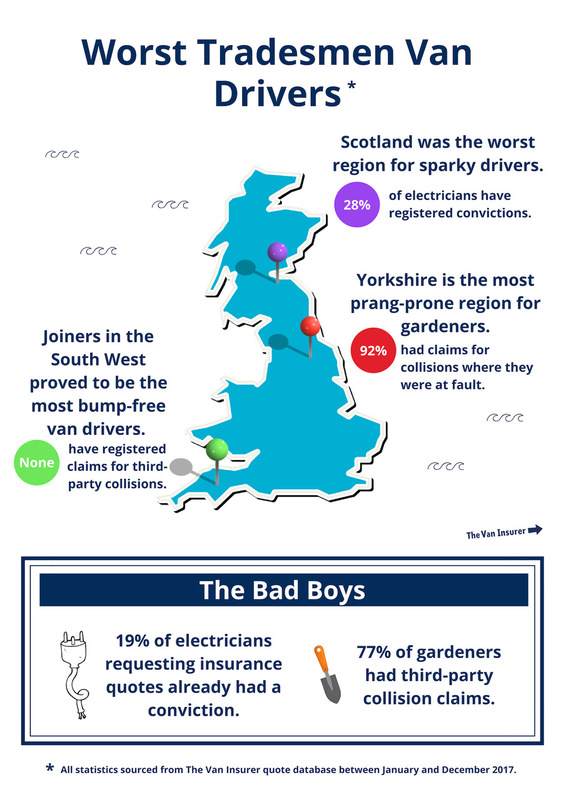 Yorkshire was highlighted as the most prang-prone region, with 92 per cent of fault claims made by gardeners being for third party collisions. At the other end of the scale, joiners were identified as the most careful drivers, with less than two-thirds of fault claims due to collisions. Joiners in the South West also proved to be the most bump-free van drivers, registering no at-fault collision claims. However, it isn’t all bad news for gardeners, who are the least likely to get caught out speeding, driving without insurance or using a mobile phone when driving. Electricians proved to be the bad boys of tradesmen, with 19 per cent of insurance quote requests already carrying a motoring conviction. Scotland was also the worst region for sparky van drivers, with 28 per cent of electricians registering convictions. Jade Isabelle, commercial director at The Van Insurer, said: “For tradesmen, their vans are an integral part of their business. Having a prang could affect their ability to work, affecting both their reputation and bottom line. Having the right insurance in place is just good business sense. Whatever your trade, we’re here to help you with your insurance needs, so get in touch for a quote today.